Grout serves a noble purpose. Much like mortar, it creates a bond, fills voids, and seal joints. Bonding tiles together, grout makes floors and countertops stronger. 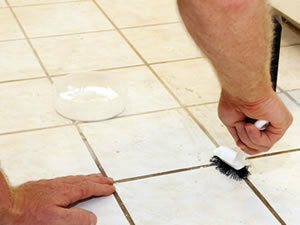 Grout repels water and protects the edges of tiles from chipping. The color of your grout contributes to the look of your tiled surfaces. But, grout is porous. It is susceptible to staining, can discolor, and attract mildew. When grout troubles begin, it’s time to take action. If your grout is not too badly stained, here are some at-home solutions that work well in small areas. For larger areas, or for grout lines that you can’t get clean, give us a call.